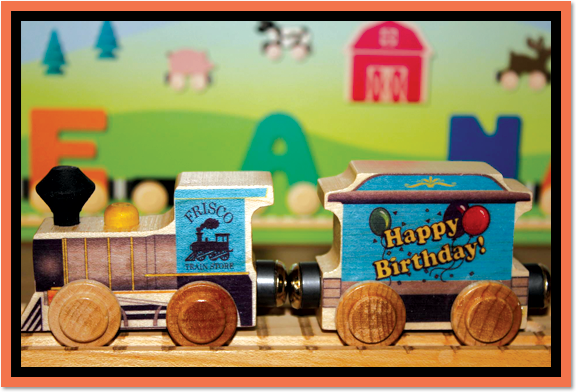 Have your next birthday party at the Frisco Train Store! We do the setup! We do the cleanup! 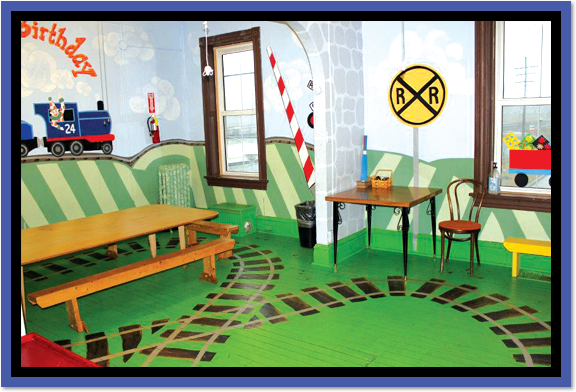 Enjoy your birthday festivities in our train themed party room. Your birthday child and friends will also love our 14 foot train table and multiple play rooms which are open only to your party! You can pay for your party in the store with cash, check or charge. You may also pay for your party over the phone with a credit card by calling us at 636-529-1660. Parties are booked on a first-come, first-served basis. We cannot hold your party timeslot until full payment is received. Birthday party fees are non-refundable. You may have The Frisco Train Store re-open your time slot if you would like to try to cancel your party. If your time slot is booked, we can refund your money. If your time slot needs to be moved, we will make every effort to work with you. We need at least 2 weeks notice to change your party to a different time on the same weekend if one is available. We need at least 4 weeks notice to move your party to a different weekend. 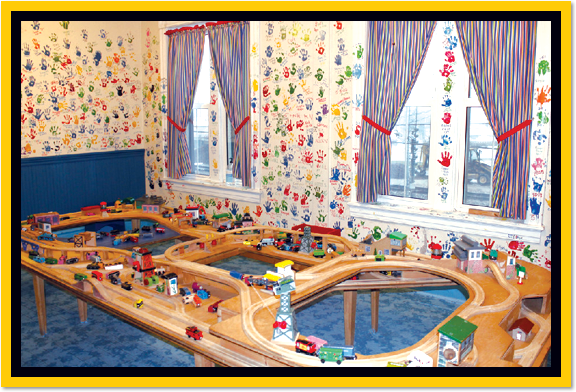 Once in the party room, the children will play a party game, either the Train Piñata or Hot Engine Game. After the game, the hostess will bring the children to the table for cake, or start with lunch and then cake if that is something you have decided to include. If you choose to open gifts, the children then sit in a circle for gift opening. Your party will spend the remaining time playing in our play rooms. When your party time is over, we ask that you gather your guests and party items from the party rooms and move downstairs. This is in consideration to the party that follows yours, and to your party hostess. We thank you for your assistance with this issue. If our store is still open, you and your guests are then welcome to gather downstairs in the store. Steam Engine Piñata – We fill a train shaped piñata with candy and provide a Nerf covered bat and brown paper bags for the children to collect the candy. The piñata game is great for children of all ages! Hot Engine Game – This game is played the way the classic game of “Hot Potato” is played, except we use an engine that is “hot” from working all day. We did change the rules a bit: when the train music stops, the child who is holding the “hot” engine will get a bag of candy and leave the circle. This continues until all of the children have received a bag of candy. The Hot Engine game is great for children 5 and 6 years old, but may be too long or complicated for younger children to understand. *All party games are run by your party hostess. You may bring a cake and/or lunch. You are also welcome to bring a cooler with drinks for your guests. Please note: We do not allow alcoholic beverages in the building at any time. If you choose to order pizzas for your party, please feel free to contact our store and we can give you the numbers to several pizza places that deliver to our parties on a regular basis. Please make sure to call your pizza places ahead of time, and have your pizza delivered at your party start time. You are responsible for paying and tipping your delivery drivers. Can I bring decorations and balloons? Both of our rooms are colorful and fun, but you are more than welcome to bring in your own decorations and balloons. However, we do have ceiling fans in all of our rooms and require that balloons be weighted at all times. If you would like to hand balloons out to children as they leave, please make sure they are outside of the building first. What kind of candy is used for the party games? Because of allergy concerns and the ages of our guests, we have chosen to use the Tootsie Mix candy. This includes Tootsie Rolls in various flavors, Tootsie Pops and Dots candies. If you would like to use your own candy, please inform us ahead of time. How early can I arrive to set-up my party? You may arrive up to 10 minutes ahead of your party start time to set-up your party. Your party hostess will help you with your set-up, as well as take care of the clean-up. Can my party guests play downstairs before and/or after my party? Your guests are more than welcome to come in before or stay after your party to play downstairs in our store if we are still open. The main floor play area closes at 5pm, but the store will be open for purchases until the end of the last party. Please note that we cannot allow any birthday activities (cake, gift opening, etc.) in the store at any time. What if I have more than one birthday child? No problem! There is an additional charge of $15.00 for each additional birthday child. This refers to additional children celebrating their birthday, not party guests. Parties are limited to a maximum of 15 party guests. This number does not include all parents, grandparents, etc. Party guests are children that are of the age to participate in the party game, sit at the cake table and play at the train table. We are sorry, but we cannot allow more than 15 party guests per party, even at an additional fee. Please note that seating is limited for adults attending the party. The party rooms are located on the second floor. Due to the age and historical nature of the building, they are only accessible by staircase. What if we don’t want to open presents? Many people choose not to open presents at their party to save time. We can collect your presents downstairs for easy loading into your vehicle after your party. Can I tip my party hostess? It is not required or expected to tip your party hostess, but tips are definitely welcome and appreciated. The Frisco Train store offers many different items for party treat bags. If you book a party at our store, you get 20% OFF any bulk items that you purchase for treat-bags. Plus, we will even put them into fun party bags for you! 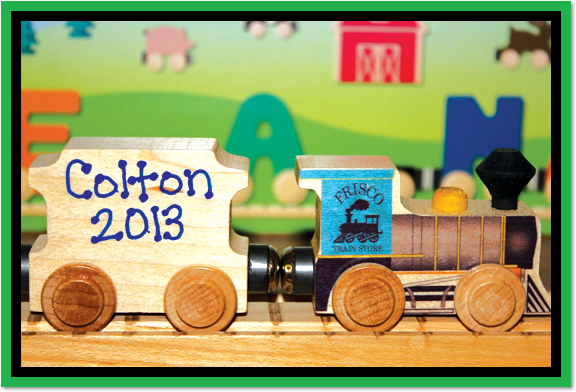 We also stock train-themed party supplies in our store that are also 20% OFF if you book your party with us! See more photos of our party rooms in our Facebook photo album. Copyright Frisco Train Store © 2019. All Rights Reserved.